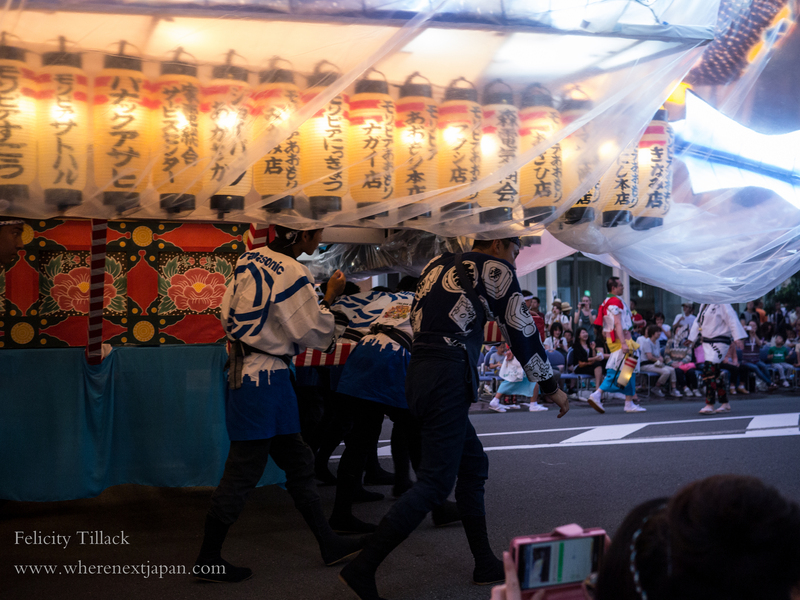 Aomori city’s Neputa matsuri is one of the three big festivals in northern Japan, including Sendai’s Tanabata, and Akita city’s Kanto Matsuri. It’s become increasingly popular over the last few years, perhaps thanks to the shinkansen line that made it that little bit closer. One of the tricky things about this festival, compared to most that I’ve ever been to, is the seating. Chairs are set out on the pavement, and large rectangles are taped off. How much these cost, how to buy seats, whether gaps between the tape are really up for grabs… remains a mystery. Sites like Japan Guide put price tags of around 2500 yen for basic seats, and up to 5000 yen for premium seating, but actually walking along the streets there were no touts, no signs… We snared a seat near the gutter, between banks of chairs, behind three young women who didn’t mind sharing with us. Then again, we did come for the first night of Neputa. The first two nights are reputedly quieter. 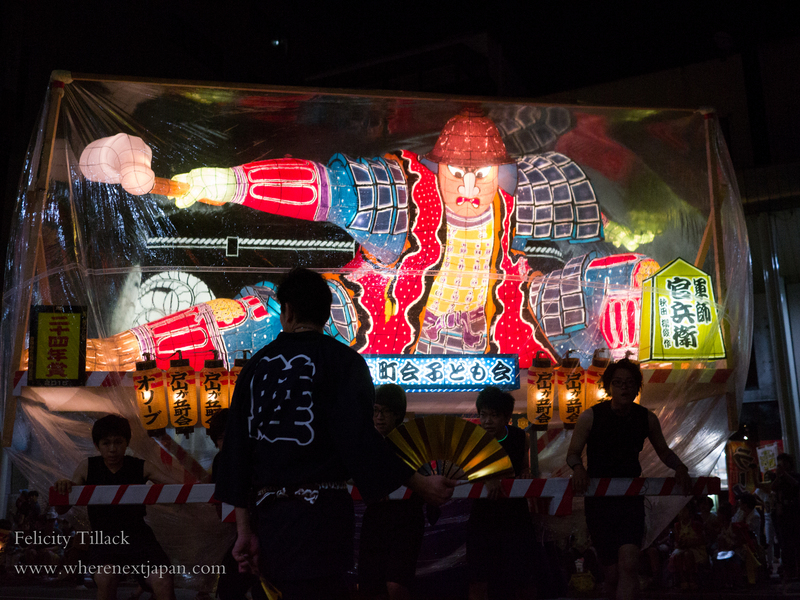 Floats are dragged, not carried, and they are smaller than floats on the final night. 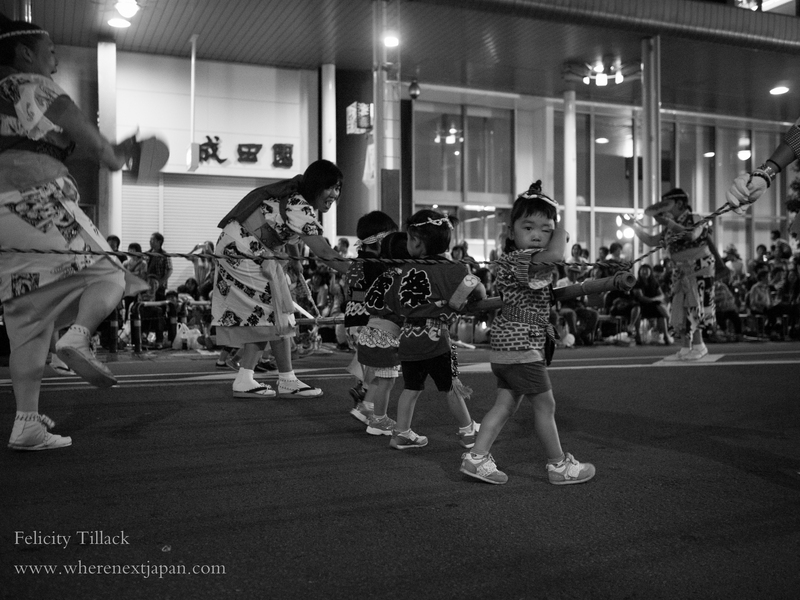 There are also children floats, which are pretty cute. 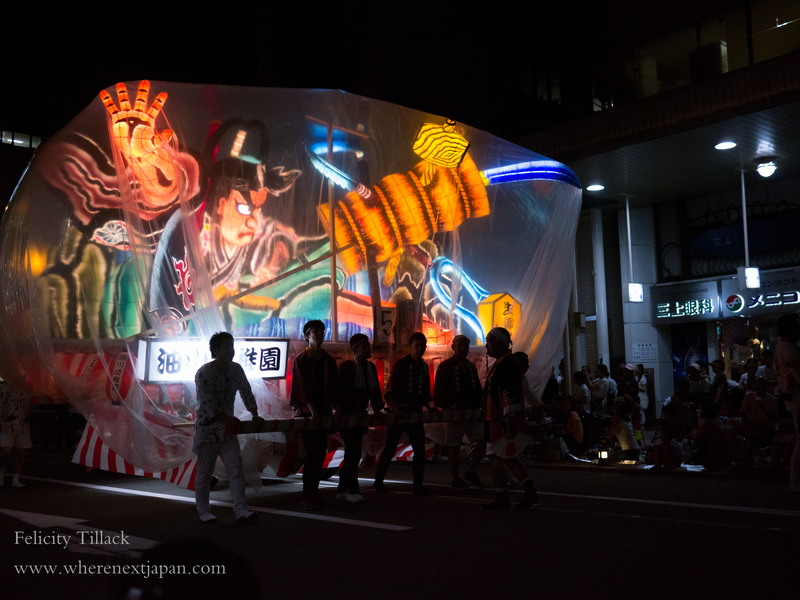 Despite being the softer events, there were still taiko drums and symbol dancers to heighten the mood. 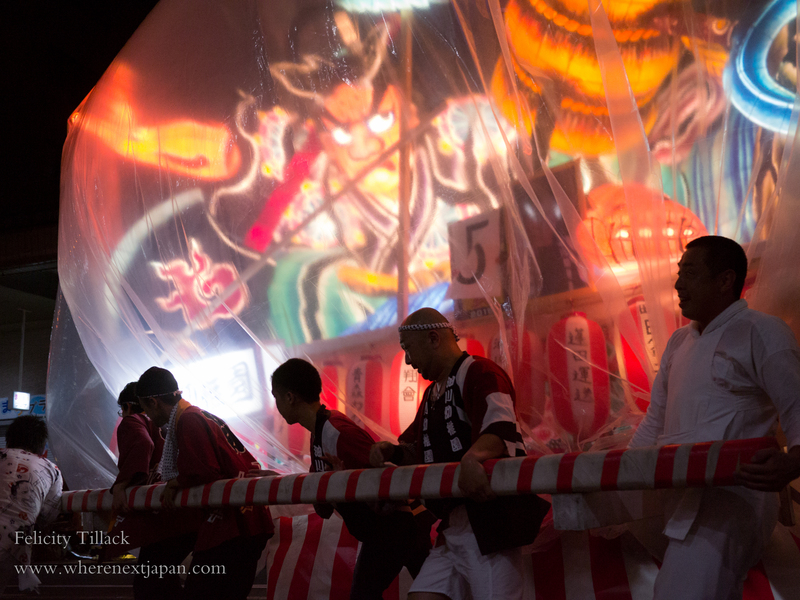 A sharp, but brief downpour just before the festival started meant the floats were wrapped in thin plastic bags. Some viewers were disappointed, but it added a kind of interesting, gold-fish bowl look. 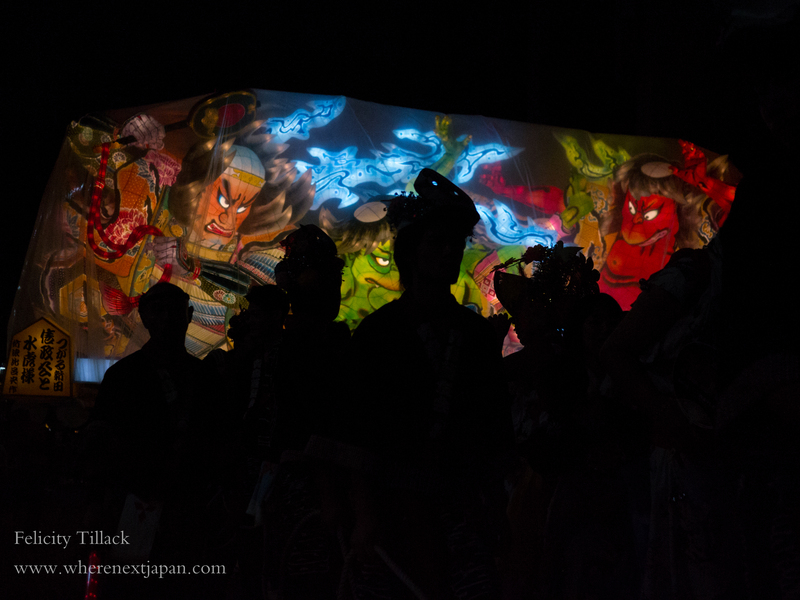 Aomori Neputa matsuri: August 2nd – 7th. 18:00 – 21:00. If coming by train, be aware of the time-table, there can be large gaps between trains. 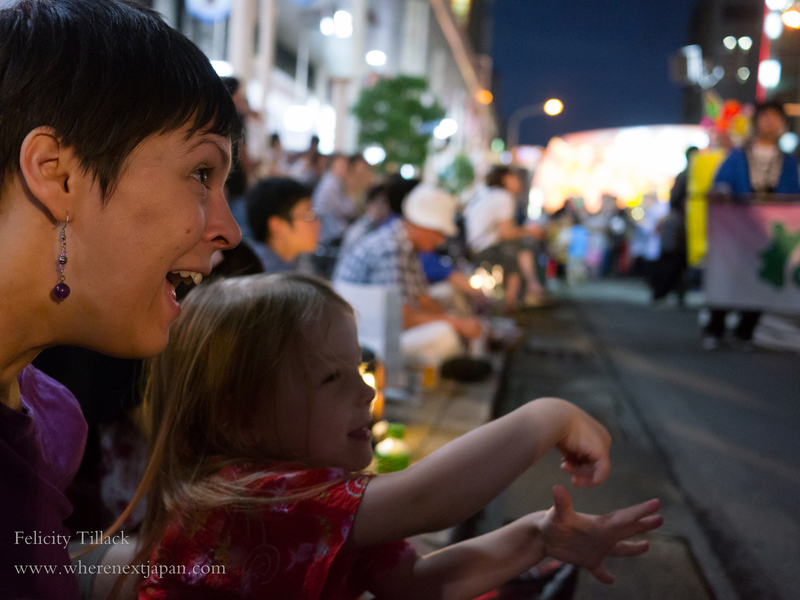 If arriving by car, there are large, public parking spaces created for the festival, for only 500 yen. We arrived at 16:30pm on the 2nd and there were still spaces, but it was filling up quickly. We really lucked out on those seats, didn’t we? A fun evening, rain and all.